Black Diamond cards have always had a distinctive textured foil look to the cards - and this year it's no different. The Black Diamond base cards come on thin card stock and are mostly covered in foil. 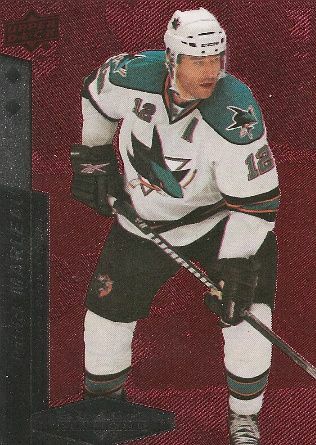 The players on the front of the card 'pop out' because they don't share the same effect as the background. I have to say that I have never been a huge fan of Black Diamond's M.O., but it is what it is and this brand of card will not likely change anytime soon. That being said, the cards are pleasing to look at and don't get all bendy like Certified tends to do. The base card set is split into 4 levels. There are single diamonds, double diamonds, triple diamonds, and quad diamonds. I guess these levels correspond somewhat to how 'good' a player is. The quad diamonds tend to have all the star players. Having this tiered system can make Black Diamond a challenging set to collect. There are very few triple and quad diamonds in a box. The rarity of these cards help make the base set have more value though. 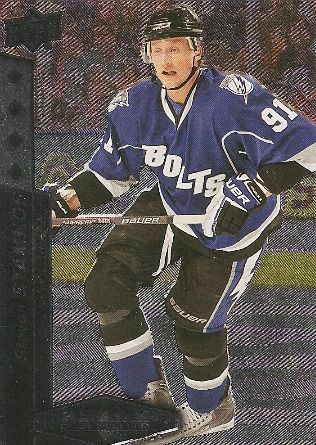 As with most hockey products, the rookie cards are also included in the base set, but are more limited. The rookies also share the tiered system. The rookie cards look very similar to the base cards in that they have the same textured look, but the texturing of the background has a diamond pattern to it. The rookies in Black Diamond are called Rookie Gems. 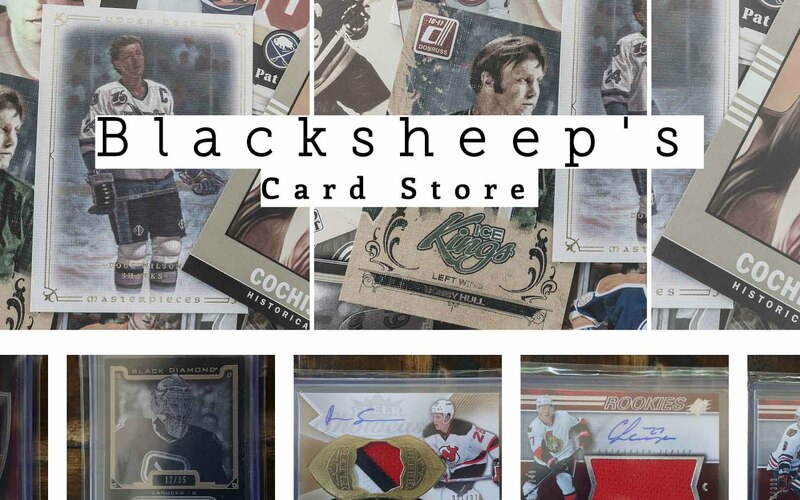 Unlike many of the more recent hockey sets, these cards are not individually serial numbered. Black Diamond's base cards continue on the tradition of the line. 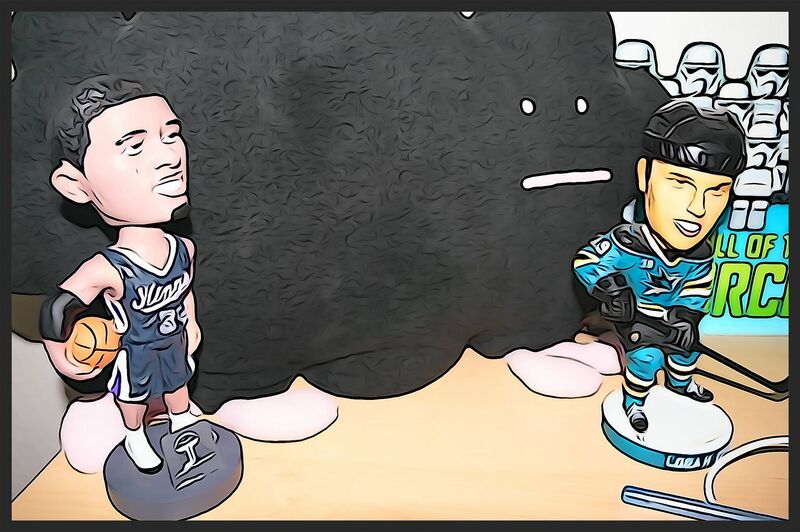 It would be nice for Upper Deck to come up with something a bit more different, but I think they are happy with how the product has been doing so they'll probably stick with what works. Overall, I think the Black Diamond base set would be an 'ok' set to collect, but I don't see anything in it that really stands out from any other year's offering. Black Diamond offers an array of inserts. One of the nicest inserts I've gotten in a while is from the box I opened. 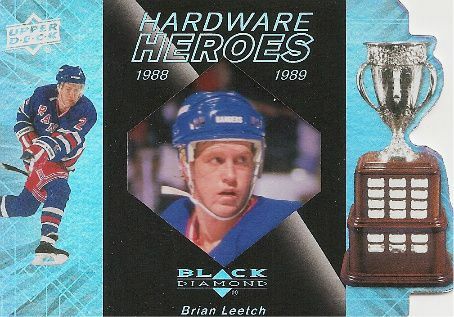 It was a Hardware Heroes card of Brian Leetch. This card features a really nice rainbow foil effect (sorry, you can't see this from the scan), a clear window with an image of Brian, as well as some nice die cutting. This insert reminds me of older insert cards when companies really relied on superior design to sell cards and make people want inserts. I was very impressed by this card and I know that there are other die cut inserts besides this in Black Diamond. On the other side of things, Black Diamond averages two game-used cards per box. The Quad Jersey insert features 4 pieces of jersey. I got Carey Price and Nathan Horton in my box. To be frank, I do not like the design of these. To me they are very un-Black Diamond. Let me explain. Black Diamond cards are dark cards. The foiling of the cards and the overall color scheme of the product is dark. 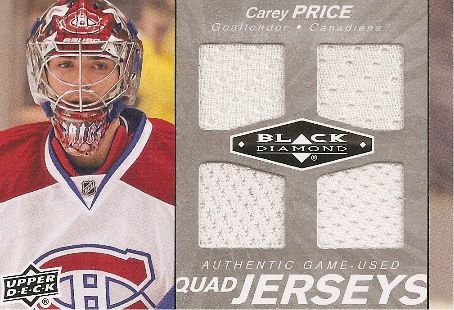 The Quad Jersey inserts are very bright colored and have no artistic tie-in with the Black Diamond set other than the BD logo placed in the center of the jersey pieces. These jersey cards look like they belong in Upper Deck Series 1. I would recommend to Upper Deck that they use the foiling they use for the base cards on their jersey inserts. It would tie in much better and actually look like a part of the rest of Black Diamond. Ruby card parallels can also be found in the packs. These are red themed parallel cards to the set. Each card is serial numbered to 100. 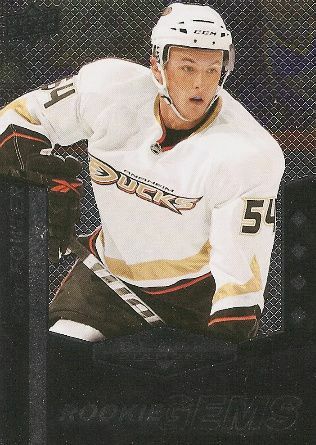 Furthermore, Black Diamond has gold and platinum versions of base cards as well as quad jersey parallels too. I'd like to mention that when buying a box of Black Diamond, you will receive a bonus pack of UD Ice cards. 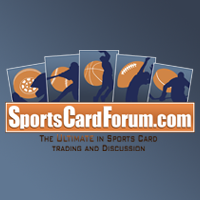 Upper Deck is not coming out with Ice cards this year so they are releasing them in other UD sets throughout the year. In a typical bonus pack there are 5 cards - 4 ice base cards and an Ice Premiers rookie card. Ice Premier rookie cards have always been a pretty hot collectible. It's nice to get them like this. I like the look of both cards from Ice this year. 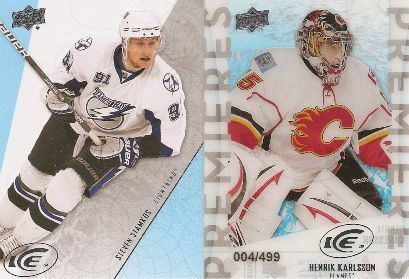 Here is a scan of a couple cards I got from my bonus pack. Lastly, I did not pull any autograph cards out of my packs, but you can get Gemography autos at a rate of 1:60 packs. Black Diamond is a set that doesn't stand out too much for me. I am sure there are fans of the product out there, but I don't find as much excitement opening it as I do for other products such as SP Authentic and even UD Series 1. Even though Black Diamond is a really established brand, it is a product that just comes and goes without making too much of a splash. Upper Deck needs to re-evaluate this product and make it interesting somehow. Value-wise, you can get some good things out of it, and there are some nice hits... I just wouldn't get too much of it. I'd wait for bigger and better coming soon! You want to see me open my box of 10/11 Black Diamond??? Check out my video below!